What Can Mega Projects Profit From Energy Optimization? Portada » What Can Mega Projects Profit From Energy Optimization? Mega projects are infamously expensive to implement, and as much as 90% go beyond the timeline, as found by Roland Berger. The next 15 years will see an increased roll out of projects to the tune of €75 trillion in investments. The cost of these projects goes beyond finances as seen in the case of the expanded Panama Canal. As planning teams create technologies to fine-tune monumental projects to money savings, perhaps more focus should turn to the energy factor. Can energy optimization benefit mega projects in any way? From the word itself, you get an idea what this means: some kind of a huge project. In a paper titled What You Should Know about Megaprojects and Why: An Overview Bent Flyvbjerg defines a mega project as a large-scale, complex venture that costs at least $1bn. It takes many years to complete and involves both private and public stakeholders, and influences millions. Transformational as they maybe, the huge costs of the projects often elicit concern. The projects are complex and huge, so they usually overrun timelines and budgets. Analysis by Roland Berger shows that large projects have a cost overrun average of 55% of the initial budget. With the number of massive projects set to increase in future, the cost (energy costs included) overruns will definitely hit investors hard. In an effort to reduce cost escalations, project management can incorporate a robust energy optimization program in partnership with experts. Project managers can use the following simple guidelines to enhance energy optimization. First, the top management of the mega project ought to show commitment towards energy efficiency and optimization measures. Some ways of doing this are supporting the energy optimization team, rewarding suggestions and inviting employees to the strategy. No matter the size of the project, conducting an energy audit can reveal a lot. Some of the points taken from an audit are points of energy wastage, cost of the energy and possible areas of improvement. From the audit, it will be possible to form an energy management plan. There will be both short-term and long-term measures, which undergo costs and benefits analyses. Energy optimization for projects could work if implemented through the ‘energy performance contracting’ approach. In this case, they hire an energy efficiency company to help them through the following. The benefits associated with energy optimization are many and can be categorized into environmental, social and economic benefits. They will have relative importance for each mega project depending on specific situation including tax regime, energy types, energy prices and energy efficiency measures available. Companies that promote energy optimization and reduce environmental impact can gain a lot from the marketing gained. Nowadays, “green” firms are receiving good public perception. Some of the environmental benefits of energy optimization are reduced greenhouse gas emissions, reduced pollution and less destruction of the environment. Energy optimization helps firms undertaking mega projects gain competitive advantage of less efficient competitors. This enhances profit margins at current prices or lower prices for more market share. The national level perspective makes even more sense. Benefits such as these could mean a country depending less on imported energy. It could also mean life extension for energy reserves if any. Ultimately, the national economy receives a boost at meagre cost, and probably no cost on the government side. ARANER promotes energy optimization for projects in both commercial and industrial sectors, at both operational and design levels. A comprehensive strategy involves analyzing the entire system instead of focusing on independent operations. Energy optimization for mega projects makes a lot of sense economically and environmentally. Most noticeably, it reduces the cost of running the project. Most optimization solutions for mega projects have an attractive return on investment. That is why we believe mega project stakeholders will be open to a change in the status quo. Araner is a worldwide reference in outstanding Industrial Refrigeration Engineering. 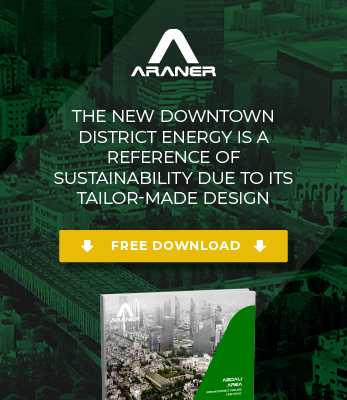 Araner provides efficient energy solutions, a full range of standard or customized products as well as tailor-made professional solutions and services in a minimal amount of time. Contact us for furhter information.